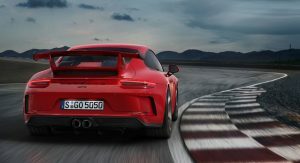 Porsche could create a road-going engine for the 911 that revs up to an stratospheric 9500 rpm. 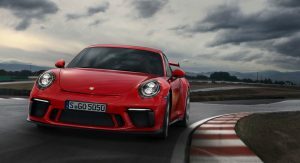 During the recent launch of the new GT3 RS, Porsche project manager for GT Road Car Engines, Thomas Mader, told Motor the automaker is investigating future developments of the latest 4.0-liter naturally-aspirated six-cylinder engine. 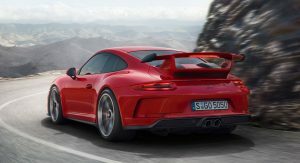 It is possible that a future derivative of this 4.0-liter could rev beyond the current 9000 rpm red line of the latest GT3. With the exception of the airbox, air filter, and exhaust, the GT3’s engine is almost identical to the units used by the 911 RSR, GT3 Cup, and R race cars. When fitted into the RSR, the engine revs to 9500 rpm. Is it possible not to love Porsche? “This is also a point for development. We will look at the things we have on racetrack to put it in the street car, that’s our job. The point is, this makes sense, because you want to have power, driveability,” Mader said. However, Mader made it clear that lifting the rev limit by 500 rpm wouldn’t be easy, particularly if the brand wants to make the engine reliable. What’s the point? Do people want a mangle of engine parts? Obviously it will be reliable if it does happen. The point is performance and engineering kudos. The question is what are the benefits of doing this? More HP, more torque? If neither, it makes no engineering sense. Chances are peak HP and torque have already been met at an earlier RPM. So consuming more fuel and chance of serious wear and tear on the engine, with no obvious benefits, seems very silly. If an engine is able to rev higher it can make more horsepower. No it isn’t. The RS cars are mainly track cars and in a track horsepower is more important than torque because the engine is used in high rpm for longer. Fundamentally wrong. F1 motors from V8’s, V10’s and V12’s were mostly all HP and relatively little torque. I wouldn’t have called them slow cars. Torque is important for moving more weight and less important in lightweight, sporting applications. Wow, as a claimed engineer, you really dont seem to understand torque and hp? If the car in question weighed 3oz and had 1000hp and 10Tq, it would be incredibly fast. High torque, low rpm applications make sense for very heavy vehicles or when the target is high-fuel-economy at lazy rpm’s. 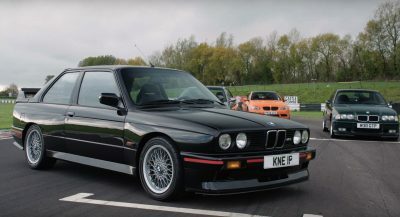 High rpms allows for far greater HP but usually with a reduction in TQ figures, thus making the most sense in very light sports car applications where such engine truly bring the car to life. Uhm, what? If you have two cars with engines that make identical torque figures, everything else is equal and one has more hp, driving them both to the engine’s full capability, the car with more hp will be quicker. A real life example of that is the Golf GTI and the Leon Cupra. Their engines have identical torque figures, the cars weight the same, same gearboxes etc and the Leon that has more hp is significantly quicker. And because excessive torque just results in wheelspin and poor ability to put power down where as having more rpm range to work with generally allows for more precision. Thus, the defining quality of the Porsche GT3 experience is usually described as incredibly precise. I think in terms of engineering, making a high performance N/A engine is more of an art. agreed! And what a beautiful art! Whats the point???? You must not love sports cars. High RPM engines are the heart and soul of any true sports car and help it mimic the race-car theatrics. The epic sound they make and the instant throttle response of an n.a. engine give the driver goosebumps along with adding to the wonderful theatre that should accompany any 6-figure automotive toy. It doesnt, if you’re engineering lightbulbs or refrigerators. If you love cars you love high rpm n.a. motors. That simple. I agree, this is cool. But, reliability is a concern. They’ll nail the reliability within warranty parameters. The real scary consideration is long term ownership. High rpm, high HP, big motors tend to use exotic materials to remain light and as most know, a high rpm motor is higher stressed and generally also easier to blow. I cant imagine engine replacement costs. I know that run of the mill flat-6’s for the lower end 911’s are already a small fortune. Of course they can pull it off for the road too. I’d suspect they could even do 10k rpm if they wanted. Clearly materials are key for longevity and weight may not be similar to the race version, but it sure would be one epic motor! !